The elegant Tilley TH8 Hemp Hat is specifically designed for women. Wear the brim up all the way or jauntily tipped to set the tone for any occasion. Add your personal panache with a scarf, vibrant hat band or eye-catching pin. 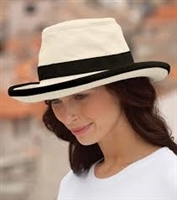 The all-around 3 inch wide brim offers sun protection and style. Hemp is the world's strongest natural fiber. It is breathable, and naturally resistant to UV light, mold, mildew and salt water. Tilley Hemp fabric has been tested and certified as having a UPF 50+; this is the maximum UV protection rating given. Washing Instructions: Machine wash in warm or cool water. Do not use bleach. Smooth and reshape the Hat by hand and set it out to air dry. This special order hat can take up to 3-4 days to ship. For the proper fit, you should be able to easily insert two fingers, flat, between the middle of your forehead and the front of the hat. Tilley Airflow Hat with broader down-sloping brim with 3/4'' mesh crown. Guaranteed for Life, insured against loss, excellent sun protection, repels rain, Floats, ties on in the wind, machine washable (won't shrink). Brim front and back:3 1/2'', Sides:2 1/2'', Weight: 3oz. Tilley Airflow Hat with broader down-sloping brim with 3/4'' mesh crown. Guaranteed for Life, insured against loss, (we fill out the paperwork for you) excellent sun protection, repels rain, Floats, ties on in the wind, machine washable (won't shrink). Brim front and back:3 1/2'', Sides:2 1/2'', Weight: 3oz. (Chocolate is no longer available, The Tilley Womens Hemp Hat is elegantly designed and made from hardworking Hemp, the TH9 Hemp Hat provides maximum sun protection with maximum style. The wide brim can be worn up, down or any jaunty angle that strikes the fancy. Hemp is one of nature's finest fibres and while it will soften and fade over time (like a favourite pair of jeans), it will remain durable and protective.Guaranteed for life, insured against loss, excellent sun protection, repels rain, ties on in the wind, hand wash gently in warm water with mild soap air dry. Weight: 5.6oz. Brim Measurements: Front and Sides: 3" Back: 2 3/4"